The UK-made VW mild steel platform scale has been firmly established at the forefront of UK industrial weighing for over 25 years. The platform’s proven design and impressive build quality, along with it’s OIML approved IP67 waterproof stainless steel loadcells, guarantee long lasting, accurate and reliable weighing performance. 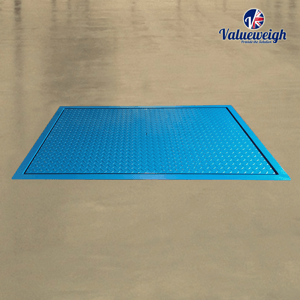 The VW range is designed and built to order in the UK and as such can be customised to satisfy almost any requirement including custom dimensions, capacity, colour, smooth top plate, ramps or in-ground/dormant applications with pit frames and removable top plates. All models feature stainless height adjustable feet, a sealed stainless junction box and a tough and highly durable powder-coated finish and are backed by a full 2 year warranty.